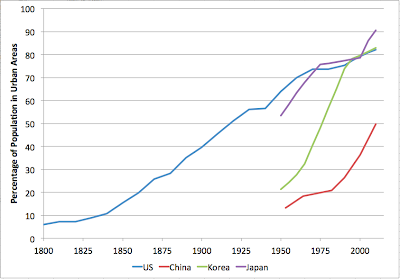 Commenter Don Johnson raised the question of how the speed of Chinese urbanization compared to other countries. Above are some relevant comparisons - with the US, Japan, and South Korea. Data are from the UN and the US Census Bureau. 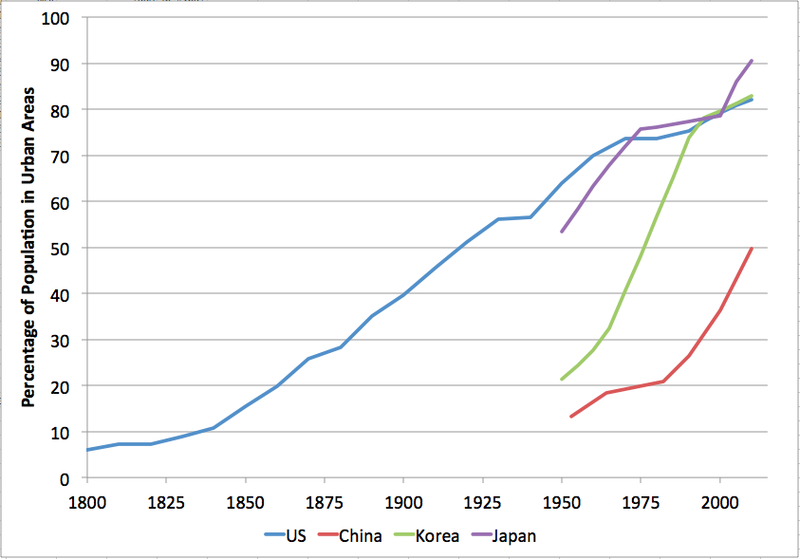 China is urbanizing much faster than the US did, and probably Japan too, but not as fast as Korea. Of course, these are relative comparisons. 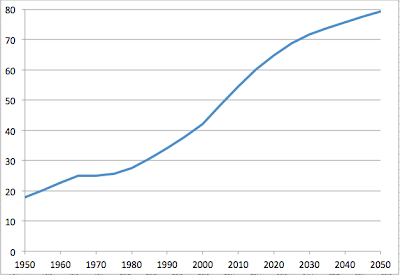 The absolute scale of China's urbanization is completely unprecedented. The Korean example doesn't seem to provide much support for my speculation that very fast urbanization processes end earlier due to running out of young people. Instead, all three precedents seem to have slowed down sharply around the 75% point. 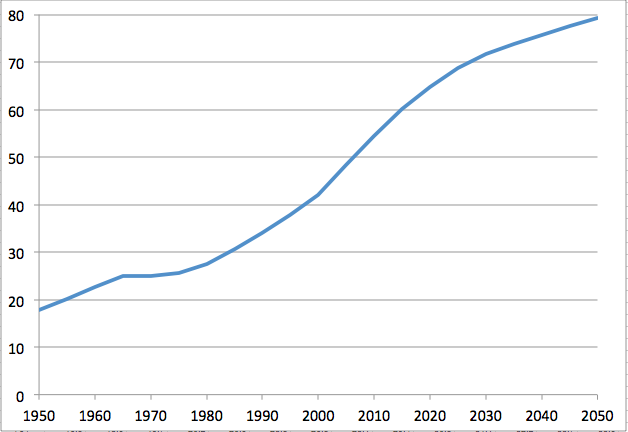 In the US case, this was reached in the 1960s, and we are still only 82% urban. Some of us just like living in the country.
" In the US case, this was reached in the 1960s, and we are still only 82% urban. Some of us just like living in the country." I think this is kind of an artificial condition due to politics, which would be a discussion of it's own. If decisions were based purely on economics, the US would probably have a much lower rural population, one just big enough to run the farms and other resource industries. 2) Subsidized or mandated Rural Telephony (Okay Cell Phones have changed this, it's getting much less common to find a spot without service even in Bumf*#$, Egypt. 3) Transfer payments like Social Security, Food Stamps, Veteran's Pensions, and other things. I live in a rural area, and my take is most rural areas wouldn't be viable without these things. There just isn't enough economic activity going on for most of these people to support themselves on what they potentially could earn. There's no guarantee that any other country will have the leeway or interest in subsidizing this kind of thing. Sunbeam, having recently bought some land and a house in a deeply rural location (central Aroostook County, Maine), I too have noted how rural areas are depending more and more on government subsidies and retirement money inflows for their economic sustenance. Even my neighbor, a 50-something industrially-sized potato farmer that has lived his entire life in "The County", has noticed this and lamented it. Just the same, such a phenomenon has its bright side and is to be expected and even welcomed. For, if people that don't depend on showing up daily at some corporate, governmental, or institutional location for their weekly income actually stayed to live in the urban and suburban locations where most working people lived, those that *must* live in the populated areas would be competing against even more humans for our domicile and highway space. That many people with government and/or retirement payments have figured out that they can live in the "middle of nowhere" on a tiny fraction of what it costs back in Metropolis, is to everyone's benefit. After all, somebody has to live in Hooterville, so to speak.